Who’s the Forger? At least one question about the fake Leonardo bicycle remains, namely “who done it?” Although Marinoni has been overly gullible, rejecting all reasonable arguments about the drawing being a fake, it should by no means be suggested it is he who drew the lines that made the circular outlines showing through from an unrelated drawing on the front into a bicycle on the back. Nor has anyone so far pointed a finger at the monks of Grottaferrata. Unfortunately, some writers (including Jonathan Knight of the New Scienctist and Frederico di Trocchio in L'Espresso) have interpreted the information that way, and thus indirectly implicated Prof. Lessing, the author of our article, as being the source of such speculation. The reader is invited to judge for him- or herself whether Prof. Lessing is making such claims in the following texts. Until some time ago, if you Click here you would get a link to the related web site for the original article by Prof. Federico di Trocchio in the Italian weekly L’Espresso. News of a bicycle-like sketch said to have been discovered during the ten-year restoring period of Leonardo da Vinci’s Codex Atlanticus popped up in 1974, when literary historian Augusto Marinoni gave a lecture in Vinci, Leonardo’s birthplace. From the chronology of disclosures and (in part circumstantial) evidence, it is now becoming clear that we are dealing with a recent forgery. Several nations have been involved in the bicycle’s (and the motorcycle’s) development, and some decisive concepts can be attributed to individuals within those countries. Thus, for example, the basic two-wheeler concept on which all bicycles are based is attributed to Karl von Drais, a civil servant with a background in technology acquired at the University of Heidelberg in Germany. [1 (Footnotes can be accessed by clicking the appropriate line "Click here for footnotes/bibliography" above or the individual footnote number in the text)] Drais’ invention is well-documented with patent specifications and other materials which suggest that it was unprecedented. Nevertheless, the competition between the industrial nations leading to World War I created jingoistic priority myths, usually launched to attribute priority to the forger’s nation. Even before this conference was initiated in 1990 by Nicholas Clayton to replace such myths by serious historiography, our French delegate Jacques Seray had been able in 1976 to destroy the non-steerable two-wheeler myth created in France in the 1890s and generally accepted thereafter. But until 1976 it was believed worldwide that the first incarnation of the two-wheeler principle was not steerable (a myth that is still repeated by some today), and therefore competing priority myths depict unsteerable two-wheelers, too. Seen in the light of Seray’s research, “Leonardo’s bicycle” publicized worldwide in 1974—and again non-steerable—left bicycle historians like Derek Roberts skeptical, since a “law of series” appeared to apply. The “Leonardo bicycle” sketch shows a non-steerable two-wheeler in an attempt to outdo the false French priority which was still believed to be correct before 1976. 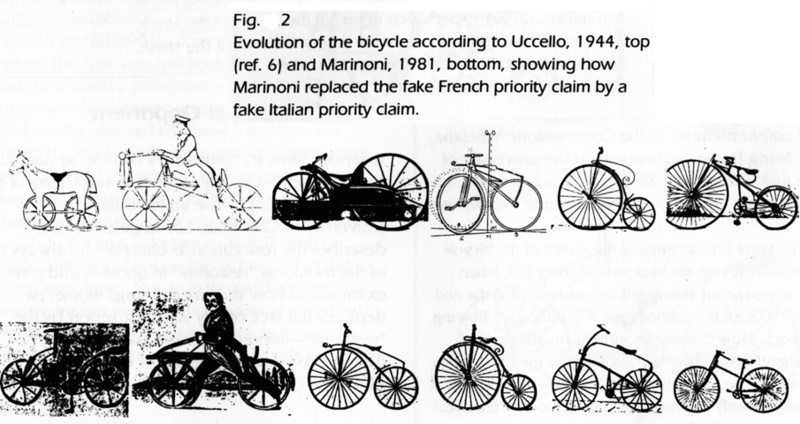 This is also confirmed by a comparison of the pictorial bicycle evolution taken from the standard Italian book on history of technology and from Marinoni, Ref. 19 (see Fig. 2). The Sisyphean task of tracing the debate on the restoration of Leonardo’s Codex Atlanticus in Italy thirty years ago is eased by the fact that Augusto Marinoni, an Italian lexicographer and philologian, then at the Catholic University of Milan, appears to be the only maintainer of the genuineness of the bicycle sketch among Leonardo scholars. Catalogues of exhibitions and books where Marinoni was not involved demonstrate a conspicuous absense of the bicycle sketch (e.g., Ref. 12). In what follows, I will concentrate on the bicycle sketch alone. The restoration of the Codex Atlanticus was the result of an initiative of engineer Nando di Toni, who ran a Centro Ricerche Leonardiane in Brescia with a newsletter Notiziario Vinciano, and French Leonardo scholar André Corbeau, who managed to exhibit original sheets from the Codex in Paris as early as 1961. This may account for the different durations given for the restoration period: While Marinoni talks of ten years, between 1960 and 1970 (presumably to include dismantling of the album for the Paris exhibition), the director of the Biblioteca Ambrosiana in Milan specified the restoration period as 1966 until 1969. Pope Paul VI, born a Brescian and at that time archbishop of Milan, gave his consent to the restoration under the condition that it was to be performed by monks in the cloister Grottaferrata near Rome for the reason that the Codex Atlanticus and the Ambrosian Library belong to the Vatican. The worldwide communication of the popularisation “bicycle-like” for the transmission chains from Codices Madrid suggested the forgery of a “Leonardo chain bicycle” to the forger(s), allowing the forgery to be dated to the post-1967 period. An identical chain drive appears in the bicycle sketch put into the Codex Atlanticus. It seems that the library’s director in Madrid became disenchanted with this press interpretation and cancelled his contract with Piccus and Reti, contacting scholars in Milan and London for the facsimile edition of the Codices Madrid. Let us turn to the debate after Marinoni had released the bicycle sketch in a lecture at Leonardo’s birthplace Vinci on April 15, 1974 covering the Codices Madrid—although the bicycle sketch was found in the Codex Atlanticus. At the time of this lecture, the printing of the bicycle sketch was irrevocably underway in the Italian original of The Unknown Leonardo (Ref. 4) and in volume Two of the new Giunti facsimile, which may have been one reason for the delayed disclosure. Or is there another reason to withhold disclosure of a seemingly sensational discovery for four years or more? Marinoni never gave the details, nor the date of his discovery. In his presentation, he tried to disprove the objection from an undisclosed source that a youngster may have manipulated the sketch into the Codex around the turn of the century— presumably a rhetorical position he thought up himself. It is, of course, not good academic style to conceal names or quotes of opponents—and Marinoni holds back the fact that the Codex Atlanticus had undergone a ten-year reproduction for the old Hoepli facsimile at the turn of the century, providing access to it for many. Also it is the experience of this conference that jingoism befalls those with greying temples rather than young people. The bicycle sketch became known worldwide through the popular three-volume set The Unknown Leonardo in 1974. Not many then realised that the bicycle find was not in volume 3, Leonardo The Inventor, where it would have belonged, but banished into an appendix to the second volume, Leonardo The Scientist, among whose authors was Augusto Marinoni—an indication of a dissension between sceptic editor Reti and maintainer Marinoni. Clearly the sketch is not from Leonardo’s hand, and without proven contemporaneity of the scribbles, Marinoni’s tale of a pupil copying the bicycle from a lost drawing of his master remains mere speculation. The strategy is to give the reader the impression that the opponent has been disproved completely without letting him know the opponent’s argument. Apparently a chemical analysis or an age test was never performed on the bicycle sketch. And like in the famous case of the Piltdown Man, we always have the option that Marinoni was the uninitiated discoverer of what was done by a different forger or forgers. However, an important piece of evidence in dating the bicycle sketch is that it is not from Leonardo’s hand and produced no visible set-off overleaf in contrast to the obscene scribbles surrounding it—an indication that it has been put in after the unfolding of the sheet. He quotes Marinoni by Ref. 4 and Ref. In 1961 the translucent back side showed geometrical circles and lines. The bicycle sketch definitely was not there, since its thick brown crayon would have been detected easily in translucence. The forger(s) made economic use of the lines already present (to minimize crude erasures like the ones between the wheels) which explains the idiosyncrasies of the handlebar design. Accordingly, the bicycle sketch is definitely a recent forgery that can be dated between 1967 and 1974. The importance of this coincidence should not be underestimated, since this is a detail that no modern forger could know before publication of the said Codex in the year 1974. This refers to the facsimile edition of Codices Madrid, Ref. 13. But—see above—there were numerous newspapers and news magazines worldwide reporting this very sample page in 1967, including an Italian publication by Nando di Toni in 1967. It can be predicted that Marinoni or his Internet-publishing entourage will use his piecemeal release of discovery detail to claim now that he discovered the sketch before 1967; but having lied once, he will no longer be believed by academia. Again, Marinoni fails to date this incident. Fig. 4 of original article, also Fig "Update-1"
1. Keizo Kobayashi. Histoire du Vélocipède de Drais à Michaux 1817-1870 – Mythes et Réalités. Bicycle Culture Center, Tokyo, 1993. 2. Jacques Seray, in: Cyclisme (Paris), No. 100, April 1976), pp. 17-21; Jacques Seray. Deux Roues – La véritable Histoire du Vélo. Editions du Rouergue, 1988. 2a. Robert W. Jeanes. Des origines du vocabulaire cycliste français. unpublished thesis, Université de Paris, 1950. 3. Herbert Osbaldeston Duncan. The World on Wheels, Paris, 1926, p.265. In reality, the Stoke Poges window shows a one-wheeled waywiser for land surveyors; see Frank R. Whitt in Cycletouring (London), 10.6.1980 and Derek Roberts in The Boneshaker, No. 20 (1860). 4. Ladislao Reti (ed. ): The Unknown Leonardo, 3 volumes. McGraw-Hill, New York, 1974 (the Italian original appeared under the title Leonardo, 1974 in Milan; versions in other languages by national publishers), Vol. 2, Appendix “The Bicycle” by Augusto Marinoni. 5. Derek Roberts. Cycling History – Myths and Queries. John Pinkerton, Birmingham, 1991, pp. 17–19. 6. Arturo Uccelli. Storia della Tecnica dal Medio Evo ai nostri Giorni. Hoepli, Milan, 1944, p. 627–632. 7. Nando de Toni. L’iniziativa che ha portato al restauro di codice atlantico. Notiziario Vinciano (Brescia), No. 1 (1982), pp. 11–38. 8. Enrico Galbiati, letter of 17.10.1987 to Keizo Kobayashi, see Ref. 1, p. 344. 10. Ladislao Reti, “The two unpublished Manuscripts of Leonardo da Vinci in the Biblioteca Nacional of Madrid” I, Burlington Magazine, No. 778, vol. 110 (Jan. 1968), p. 18. 12. Paolo Galuzzi. Renaissance Engineers –From Brunelleschi to Leonardo da Vinci. Exhibition catalog, Giunti, Florence, 1996, p.222. 13. Leonardo da Vinci: I Codici di Madrid. Introduction by L.Reti, glossary and index by A. Marinoni. Giunti, Florence, 1974 (versions in other languages by national publishers). 14. A. Marinoni, “I codici di Madrid,” XIV Lettura Vinciana, Giunti BarbÅra, Florence 1974 (lecture given on 20.4.1974 in the Biblioteca Leonardiana in Vinci). 15. Il Codice Atlantico di Leonardo da Vinci. Transcribed by Augusto Marinoni, Giunti edi tion. Florence 1973–1975. 25" high, 998 copies printed. 16. Il Codice Atlantico di Leonardo da Vinci,.Hoepli, Milan, 1894–1904, 21" high, 280 copies printed. 17. Augusto Marinoni, “Una bicicletta come nuova.” L’Espresso (Milan), No.16, 21.4.1974, pp. 98-99. 18. Nando di Toni, Letteri ai Direttore, L’Espresso (Milan), No.20, 19.5.1974, p. 187. 19. Augusto Marinoni, “Leonardo da Vinci: l’automobile et la bicicletta.” Arcadia (Milan), 1981 (expanded version of a former lecture:). Augusto Marinoni, “L’automobile et la bicicletta di Leonardo,” in: Atti della Societe Leonardo da Vinci (Florence) a.73, vol. 6 (1975), pp. 285–292. 20. Giovanni Maria Pace, “Che et ha la bici.” Panorama (Milan), 9. May 1974, p. 109. 21. Carlo Pedretti. The Codex Atlanticus of Leonardo da Vinci: A Catalogue of its newly restored Sheets. Part One and Two. Harcourt-Brace-Jovanovich, New York, 1978 (descriptions only, no facsimiles). 22. Carlo Pedretti, personal communication, 1997; a more exact tracing was lost in Los Angeles due to a car theft in 1965, see: Carlo Pedretti. Leonardo da Vinci – The Royal Palace at Romorantin. Harvard University Press, Cambridge, 1972, p. 142. 23. “Uno studio del prof. Augusto Marinoni sulla bicicletta e l’automobile di Leonardo” Edizione 1996 (Febr. 1996) http://www.nemo.it/leon/bicinew.htm. 24. Carlo Pedretti, personal communication to the author in 1997. 25. Nando de Toni, “Contributo alla conoscenza dei manoscritti Vinciani 8936 e 8937 della Biblioteca Nazionale di Madrid,” Physis (Italy), anno 9 (1967) fig. 11a. 26. Vernard Foley, Edward R. Blessman, James D. Bryant, “Leonardo da Vinci und das Fahrrad,” Technikgeschichte, 50 (1983), Nr. 2, p. 103. 27. Augusto Marinoni, “Leonardo da Vinci’s Bicycle,” in: Actes de la Deuxième Conférence Internationale sur l’Histoire du Cycle, St. Etienne 1991. Quorum, Cheltenham, UK, 1992. 28. Curzio Malaparte, “Les deux visages de l’Italie: Coppi et Bartali,” in: Sport Digest (Paris) No. 6, 1949, pp. 105–109. A recent letter by Galluzzi to the author confirms in essence what was said above (see Fig “Update-1”). Hence not even the two circles are from Leonardo's hand. As late as the January 1998 issue of Scientific American, Marinoni's US partisan, Vernard Foley of Purdue University, returned with a vastly improved Leonardo bicycle replica, this time with a brand new brake operated by a pulling rope (see Fig. “Upate-2”). It came as an illustration within an article on Leonardo and the invention of the wheellock.. Rectifying letters to the editor of Scientific American by David Gordon Wilson from MIT and me were not printed in subsequent issues. Remember, Foley had built the steerable Leonardo bicycle from Leonardo's machine elements in 1983. 1. Jonathan Knight. “On your bike, Leonardo.” New Scientist, Vol. 156, No. 2104 (18 October 1997), p. 28. 2. Serge Latière. “Léonard da Vinci a perdu son vélo.” Science et Vie Junior, No. 100 (Jan. 1998), p. 24. 3. 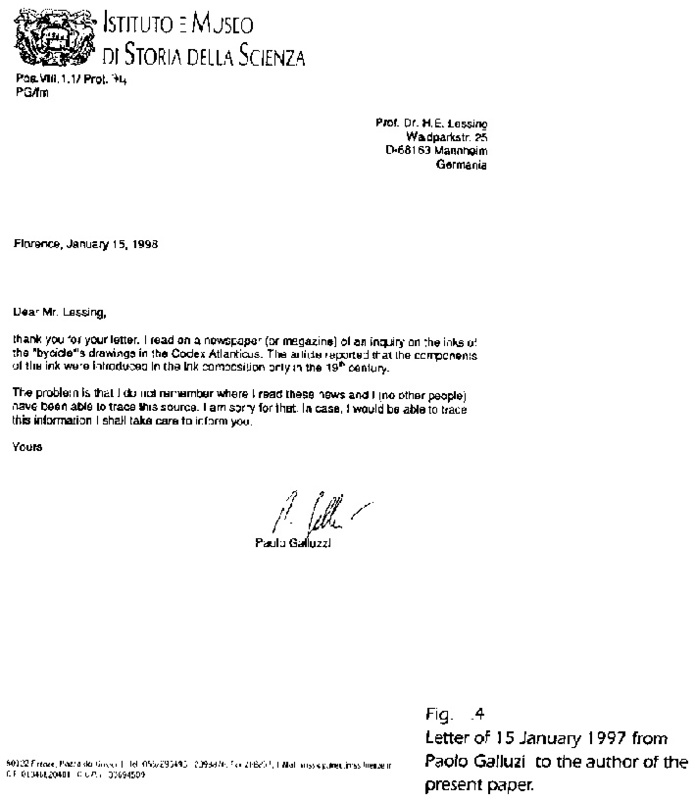 Communicated to the author the same day, 25 November 1997. 4. Fax of 27 November 1997 to Lathière, communiated by letter to the author. 5. Vernard Foley. “Leonardo and the Invention of the Wheellock.” Scientific American, 278 (January 1998), pp. 74-78. 6. Vernard Foley, Edward R. Blessman, James D. Bryant. “Leonardo da Vinci und das Fahrrad.” Technikgeschicte, 50 (1983), No. 2, pp. 100-128. 7. Now at http://rcl.nemo.it/retecif/cultura/arte/leon/bicispag1.htm (Febbraio 1996). 8. Roland Sauvaget with his brilliant French summary of all objections.